An exquisite diamond of her art style, intense and passionate, elegant yet vibrant, effortlessly spanning centuries of Kathak heritage as she does her dance space, Shovana Narayan is sheer poetry and sublime joy transcending boundaries. She is not only India’s most celebrated Kathak Guru and Maestro of the present age but she has also become a living legend who has blazed a trail in Kathak, re-defining the ethos and vocabulary of Kathak bestowing it with dignity and enriching it with a deeper and wider canvas of expression and dimensions. Every fibre of her body lives and breathes dance. Her performances are intimate yet pristine. A consummate artiste and choreographer, a revered guru to her disciples and an intellectual, she combines artistry with keen observation and humanism. She has also worked in collaborations with nationally and internationally known Indian and western dancers and musicians. She has performed before several Heads of States and Governments all over the world. In her career spanning several decades that has seen her mesmerizing audiences all over the world in several prestigious national and international festivals, she has been conferred with numerous awards, outstanding among which are the Padmashri Award for excellence and outstanding contribution to dance by the President of India in 1992 and yet again the Sangeet Natak Akademi award by the President of India in 1999-2000. Some of the other awards won by her include Delhi Govt’s Parishad Samman, Rajiv Gandhi Puraskar, Bihar Gaurav Puraskar, Indira Priyadarshini Samman, Kelvinator’s GR8Award, Rotary International Award, International Congress of Women and Japan’s Oisca Award. Shovana is a dancer with a cause. Deeply committed, involved and aware of people and their problems, she was deeply involved with the organisation and presentation of the first artists’ sensitive outpourings and endeavor to help the families affected by the Kargil war and the Tsunami. She is a regular and most ardent champion of issues related to women’s problems and the ‘specially abled’. She is the first dancer to have conceived, conceptualised and brought out a dance video on the philosophy and legend of the immortal Khajuraho temples called ‘Dance of the Temples’. Shovana’s keen interest in research have led to the discovery of an ancient 4th century BC Prakrit text (in Asokan Brahmi Script) describing the dance of the Kathaks at Varanasi and also the existence of three Kathak villages near Gaya (Bihar). She has authored several (10) books and numerous articles on the subject of dance and is also a visiting lecturer to several Universities in India and abroad. She has also guided research students for award of PhD degree in the field of dance. 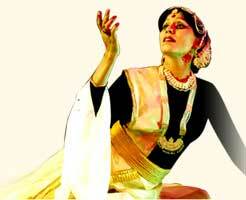 Shovana is a guru of standing whose disciples are adorning the world of classical dance. She also holds two annual festivals 2 well known annual Festivals for the past several years, one featuring the famous maestros and the other Festival ‘LalitĀrpan’ providing a platform to the young, unknown but talented future torch-bearers of the tradition. Shovana’s Asavari group is credited with many path-breaking works. Extremely versatile she not only holds two MPhil degrees, one in Defence &amp; Strategic Studies and second in Social Sciences &amp; Public Administration but she is also a Masters in Physics. She is the first person to balance two parallel professional careers, one as a very senior civil servant (IAAS 1976 batch) and as a nationally and internationally awarded classical dancer of the country. Presently she is holding the onerous responsibility of Ceremonies &amp; Culture as Special Director General in the Organising Committee, Commonwealth Games 2010 Delhi. Shovana Narayan is a classical example of a true Kathak, multi-faceted and dynamic, and presents a challenge to today’s spectator. Her life, her works, her dignity and demeanour have made her a role model and peer for millions of girls of the younger generation of today.Rare are artists who can rule the stage for decades. Seldom still are souls who pour their entire being to nurture life and society. Shovana Narayan belongs to both the categories.